"Sampath Speaking" - the thoughts of an Insurer from Thiruvallikkeni: Remembering the sacrifice of Subramaniya Siva & Kappal Ottiya Tamizhan !! Remembering the sacrifice of Subramaniya Siva & Kappal Ottiya Tamizhan !! India was born in midnight ! ~ the freedom was not a day’s affair or that of a single man packing the rulers away !! – it was a just fruit gotten by the sacrifices of very many leaders, many of whom perhaps the people of Nation have not recognised properly. The clamour to advertise that freedom was obtained without bloodshed sent to background many a great sacrifices. 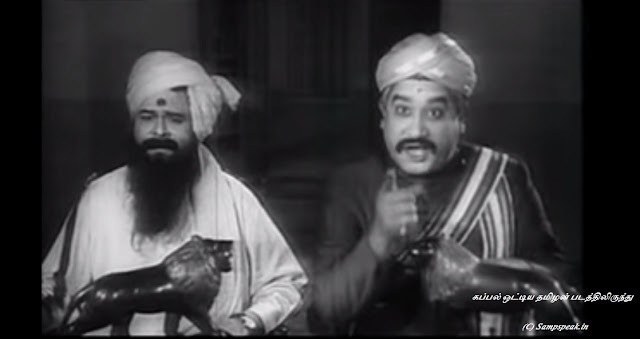 ‘Kappalottiya Thamizhan’ released in 1961 is a great movie by many counts. The film directed by B. R. Panthulu, having cast of Sivaji Ganesan, Gemini Ganesan, S. V. Subbaiah, T. K. Shanmugham, S. V. Ranga Rao, S. A. Ashokan – powerfully portrayed the freedom struggle down South. The film based on the biography of V.O.Chidambaram Pillai written by Ma. Po. Si. (M.P.Sivagnanam) taught history to later generations. The film was about VOC (Valliappan Ulaganathan Chidambaram Pillai) – the great man, the advocate, who started shipping venture challenging the British on high seas – he suffered throughout his life and struggled. VOC along with Subramanya Siva, another great patriot was summoned to Tirunelveli by the Collector (shown as Winch in the film) – that meeting was also a great scene. They were charged on sedition and sent to long years of imprisonment. It was unthinkable suffering that broke their back but never their spirit. Had it been properly documented, it would break all claims of gentleness and portray the barbarism of erstwhile British rulers. The man Subramaniya Siva is remembered today. He was born this day (4th Oct 1884). Siva was born in Batlagundu near Dindigul. In 1908, he was arrested by the British and was the first political prisoner in Madras jail. While serving a prison term, he was afflicted by leprosy and was shifted to Salem jail. Since leprosy was regarded as a contagious disease, the British authorities forbade him to travel by rail after his release and hence he was forced to travel on foot. He continued to fight for independence and was incarcerated many times until 1922. Known for his fiery speeches and rendering of Mahakavi Barathiyar songs. The relentless freedom fighter and heroic patriot Subramaniya Siva chose Papparapatti village in Pennagaram taluk as the center of activities during his last years of life and took efforts to establish a Bharatasharam in Papparapatti. He published Gnanabanu, a collection of poems and prabanyamithran magazine in which he published Articles on the importance of attaining freedom for India, freedom struggle and the service of the National leaders. He staged labour agitations in Chennai, Kolkatta, Tuticorin, Tirunelveli against British Government. Despite his illness and the severe restriction imposed on him by the British Government, he travelled places, organising people against the British. The disease and injuries sustained in the jail hastened his death, which embraced him on 23 July 1925, hardly 41 years of age. By some accounts, he had bought land at Papparapatti with public support to build a temple for Bharatha Matha. Senior leader Chitharanjan Doss had even laid a foundation stone for the temple in 1923. However, after Siva’s death in 1925, his body was buried at the spot and a memorial was built there. About a decadeago, Hon’ble Chief Minister of Tamil Nadu J Jayalalithaa inaugurated the memorial of Thyagi Subramaniya Siva constructed at a cost of Rs.40 lakhs in Papparapatti, Dharmapuri District. Today, we remember Subrahmanya Siva and the sacrifices of those people which gave us the freedom. With regards to great souls ~ S. Sampathkumar.